Without a doubt, hiking is my number one favorite outdoor activity. But as a woman, it’s hard to find good resources on hiking boots to meet my trail needs. As you may have noticed, most articles and review round-ups focus on gear for guys, which makes it difficult for us ladies to know what’s worth our money. Since I spend so much of my free time hiking, I decided to buy up some of the top brands and put them to the test in the real world to determine which ones are the best hiking boots for women like me. So, if you’re a woman in need of some new hiking boots, I hope you’ll find my reviews helpful when it’s time to gear up for your next hike. I also spent some time in Page, Arizona, Durango, Colorado and right here in my backyard at Red Rock Canyon National Conservation Area in Las Vegas (though I waited until the temps were cooler!). As you can see, I went hiking in the desert, in some high altitude areas where there was snow, some forests, some rocky areas, and some areas with wet ground. I think the only weather element that I have not had a chance to test these in was rain. However, I did manage to step in some small streams on some of my hikes. I’ve gone through a lot of hiking boots in the past decade or so that I’ve been into hiking. Most of the time, I just go with a pair of Keens since they were my first boots and there were super comfortable. 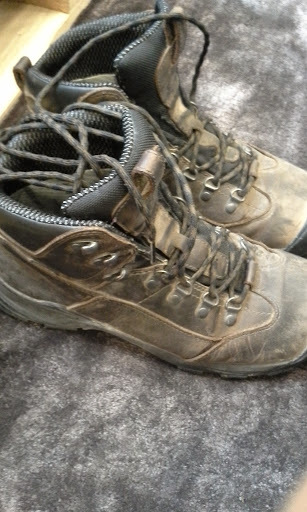 And when I was traveling in Europe and had to replace a pair of Keens, I got a pair of Jack Wolfskin boots, which were nice but not my favorite thing to wear on the trails. As you may already know, there are a lot of options when you’re shopping for hiking boots and features vary from one model to the next. I remember when I bought my very first pair that I was overwhelmed and had no idea what I needed on the trail! These days though, I know exactly what I’m looking for in a good hiking boot and I’ll share that with you below. While I never really plan to get my feet wet when hiking, it can (and does) happen. From needing to cross small streams to an unexpected rain shower, I think that being waterproof is a definite must-have in a hiking boot. You definitely don’t want to end up with wet, soggy feet because that will lead to blisters. Though this isn’t really something that you can tell when you try on a pair in your local REI, having good traction is another must-have feature. When you’re on a steep incline, moss covered rocks, or trails with loose gravel, you need to be confident that you won’t lose your footing and take a fall. That’s why good traction is important. 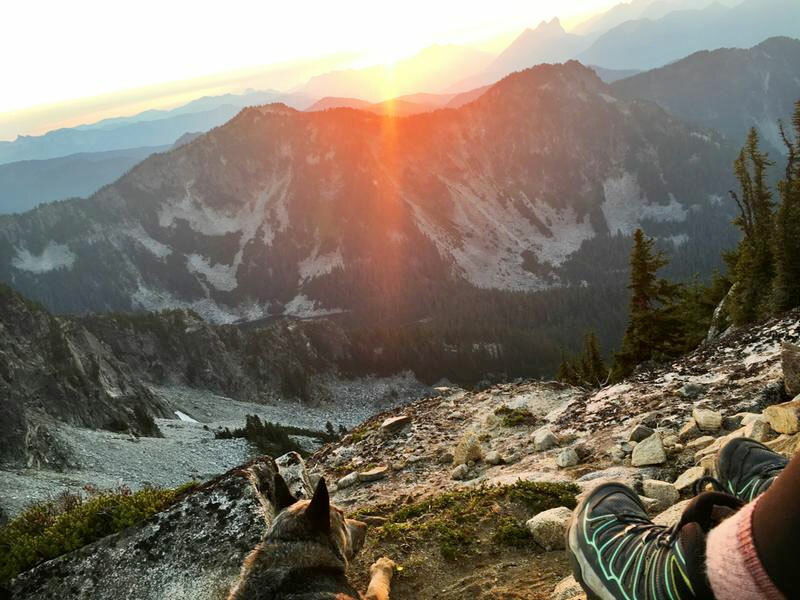 In my experience, the boots with Vibram soles all offer good traction, and as you’ll see below, Salomon hiking boots also offer excellent traction. Right here is probably the #1 most important thing to consider when shopping for new hiking boots. If they aren’t comfortable, then your hike is going to be absolutely miserable. So, you don’t want something that is too stiff or rubs your foot in any weird places. And for me, I need something that has good arch support because I have narrow, flat feet. How’s the support and stability? As important as comfort is the support of your hiking boot. And this isn’t just arch support that I’m talking about. Don’t overlook the important of good ankle support. The last thing you want to do is be six miles from the trail head when you make a misstep and twist your ankle out on the trail. That’s why you need a good hiking boot that gives you stability and support on inclines. Plus, good support and stability reduces foot and muscle fatigue, which is also important for a good experience on the trail. Since I do most of my hiking in the warmer summer months, it is important to me that my boots breathe well so that my feet don’t get too hot and sweaty. Not all boots breathe well, so if this is important to you I suggest paying attention to what you’re buying. I find that boots with some mesh features on the exterior offer the best breathability. Will they keep my feet warm? I don’t do a lot of hiking in the cold weather, but I made the mistake once of wearing my summer Keen boots in the winter and it was a terrible mistake. My toes were practically frozen for the entire hike simply because my shoes didn’t have the necessary insulation for colder temperatures. So, if you’re hiking in cold weather, be sure to wear boots that offer proper insulation. I try to avoid getting really heavy hiking boots because they tend to slow me down and give me fatigue more quickly. In fact, I chose the most lightweight options that I can find and I suggest that you do the same. Fortunately, most retailers have the weight listed so that you can easily compare models. While these are the things that I find most important when shopping for a new pair of hiking boots, keep in mind that your needs may vary. To give you an idea of some boots that I really enjoy wearing on the trails, take a look at my women’s hiking boots reviews below. You’ll find boots that I personally have taken hiking and can recommend to you as a good choice for your trail shoes. I should’ve bought this color! When I got these shoes, I was a bit hesitant about taking them out. I ordered them in the light gray color scheme, and honestly, they are probably the ugliest hiking boot I’ve ever owned. They are also the most lightweight women’s hiking boot that I’ve ever worn – and I love that feature! If you’ve seen these at your local REI, then you probably have the same thought as I did when I first touched them – will these really be durable enough for hiking? Honestly, they seem to be kind of thin and like they would rip or tear easily. Much to my surprise, they have held up just fine! In fact, I found myself wearing these Keen boots more this summer than any other pair that I own right now. They are so lightweight and cooler to wear when it’s hot out, that is was a no brainer for me to use them as my top women’s hiking boots for summer. I usually hike in smart wool socks and found these boots to be the perfect choice in the summer heat. 2018 Update: I bought these boots at the start of May 2017 and it’s now November 2018 and I need to replace them. Not sure how many miles they lasted, but I went on a lot of hikes over those 18 months. And I love these boots so much, that I’m replacing them with another identical pair from REI! And if you’ve ever worn any Keen shoes, then you’ll notice that familiar comfortable fit as soon as you get these on and lace them up. One word of caution though – the Keen Terradora Mid WP Hiking Boots are not as wide as most Keen boots. I have a relatively narrow foot, so it didn’t bother me, but if you have a wide foot or close to it, then don’t expect the usual amount of room with these. Though, I do think that these are the best women’s hiking boots for narrow feet right now. The boot has good arch support and good ankle support. My feet are relatively flat and I’ve had flare ups of plantar fasciitis in the past, and I found the arch support in these to be almost perfect for me on long hikes. And I didn’t do any breaking in of these before hiking and I got zero blisters and found them to be comfortable from the start. I found the fit to be true to size, but like I mentioned, they are not as wide as most Keen hiking boots. Though the toe box does seem as wide as normal. My one complaint about these is that they aren’t as easy to keep clean as most hiking boots. After a hike in the desert, my boots are a orangey-brown color from all the sand dust that I kicked up as I walked. Overall though, I find the Keen Terradora Mid WP Hiking Boots to be very comfortable, lightweight, and the perfect choice for summer, fall and spring hikes. And they’re so comfortable that I could see myself wearing them out on errands and such. The sole bends easily and grips well when hiking on rocky terrain where gravel is present. Despite their ugly appearance, I can definitely see myself buying another pair of these once I wear them out. 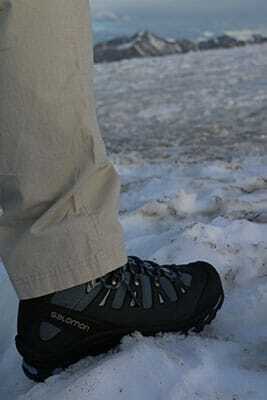 I wasn’t sure what to expect from these because they were my very first pair of Salomon boots. My first thoughts were that they seem to be very durable and not as heavy as I expected. While they’re not the heaviest hiking boots I’ve ever worn, they are certainly not as lightweight as the Keen Terradora Mid WP Hiking Boots above. That being said, I ended up loving these boots as well. 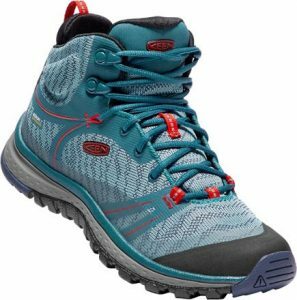 Based on my experience, I can recommend these for hikes where you need good stability or where you’re carrying a bit of a heavy load because these Salomon hiking boots are supportive, durable, and give you good stability. So, if you’re looking for the best backpacking boots for women, then I can recommend these to you. I really like how stable they felt when I was wearing them. The ankle support was awesome and the sole has a great grip for snow. I also found these to be a good choice in cold weather (I wore them in temperatures around 30 degrees Fahrenheit). With just a thin pair of smart wool socks, they kept my feet warm on my hike. After that, I expected them to be terrible in warmer weather, but they actually weren’t that bad. I did not break in these boots before wearing them either and I found them to be surprisingly comfortable. While they’re not as comfortable as the Keen Terradora Mid WP Hiking Boots above, they are certainly more comfortable than my older Keen boots. In fact, these have a comfort similar to a running shoes, which isn’t surprising since Salomon is known for making great trail running shoes. I find these to run true to size and the width is what you normally expect of a hiking boot. And they’ve got a nice, roomy toe box. On one of the trails, I actually stumbled a bit and was relived that the rubber toe caps on these boots kept my toes protected from my own clumsiness. As someone who has flat feet, I do wish that there was a just a teensy bit more arch support. But overall, I am happy with these and don’t feel that I need an extra orthotic for day hikes, but for longer hikes I think I might. So, if you have flat feet or suffer from plantar fasciitis, then keep in mind that you may need an extra orthotic insert if you do long hikes in these. These are the most expensive hiking boots that I’ve ever owned, which is honestly why I’ve never had a pair of Salomons! That is really the biggest negative about these shoes. While I do wish that they were cheaper, I can’t deny that they are worth the money. The support, traction and stability from these is almost unmatched by the other brands that I’ve tested out on the trails. Overall, I can see these being my go-to choice when I’m going on longer hikes, hikes in the cooler weather, or even just hikes where the terrain requires shoes that give me the best in stability and traction. 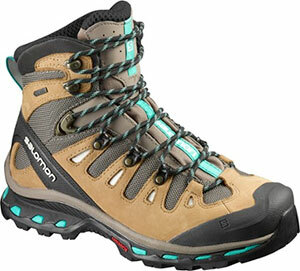 I just wish I hadn’t waited so long to get my first pair of Salomon hiking boots! I decided to get a pair of Merrell hiking boots based on a great experience with a pair of their flip flops. While I’m not crazy about how they look, I do like that they have an affordable price similar to Keens. And also like most Keen boots, the Merrell Moab 2 Mid WP Hiking Boots feature that Vibram sole for good traction. These boots didn’t require any breaking in period and were comfortable from the first step. I was pleased to see that like my Merrell flip flops, these are some comfy shoes. I feel like these Merrell Moab 2 Mid WP Hiking Boots give good arch support and the footbed is very comfortable. And the air cushion in the heel offers a lot of support and comfort – I think this feature is probably ideal for hikers who suffer from heel spurs or other heel pain. I also find that the toe box is wide and comfy in these – and larger than most Keens. Overall, these are an excellent choice for hikers with wide feet. 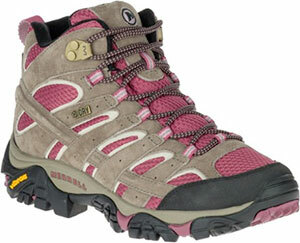 In fact, I think these are probably the best women’s hiking boots for wide feet right now. Compared to the other boots I reviewed up above, I do think that the ankle support on these is not quite as good. It’s not bad, but based on the other shoes, it could be better. I don’t really think that this is a deal breaker, unless you have some ankle issues. They are relatively lightweight and breathable, which makes the Merrell Moab 2 Mid WP Hiking Boots a good warm weather hiking boot. I would not recommend these for colder temperatures because there’s not really any insulation. My one gripe with these is that the exterior mesh seems to hold dirt. So, when I’m doing my hiking in the desert, these shoes pick up all that dust and sand in those mesh areas. Additionally, that mesh was easy to snag on the briers along the trail. In the grand scheme of things, this isn’t really a big deal unless you do most of your hiking in the desert or on trails with a lot of brush that could snag them. Overall, I think that these are a solid choice for the money. They are comfortable and have good traction, but they are really only ideal for warm weather hikes. And I don’t really think they offer the ankle support and stability that is required for longer hikes or backpacking trips. But, for the weekend hiker, these are a good buy. t seems that no matter how carefully I choose my foot attire, I always end up with my share of blisters after a long hike. Over the past few years, I have come to the realization that while you cannot always prevent the blisters from appearing, what can do is reduce the number of them that you get. With just a little planning in advance, you can really reduce the likelihood that your feet will be covered in the painful welts. These tips works for me, so I hope they give you some relief as well. If you can prevent those painful blisters from ever making an appearance on your feet, then you have a much more pleasurable experience on your hike (or other outdoor activity). Knowing how to prevent the little buggers starts with knowing what causes them. Here’s your quick science/health lesson: moisture + warmth + friction = blisters. So basically, when you’re walking and your feet get all sweaty and warm, while rubbing against your socks, your toes, ankle, etc get blisters. I’ve found that the easiest way to stop, or reduce, the blisters is to wear some good moisture-wicking socks that keep my feet dry (or at least drier than normal). I know that a lot of hikers choose to wear some wool socks for this purpose, but I actually prefer merino wool socks. They make them for both men and women and they have a low price. Before you spend the coin for the wool socks, consider giving the Nike Dri-Fits a try. I love them and when I wear any other sock, I get blisters but not with these. And, you can choose from crew length or some of the shorter ankle socks. I even wear some of the shorter ones when I go running because I love them so much. 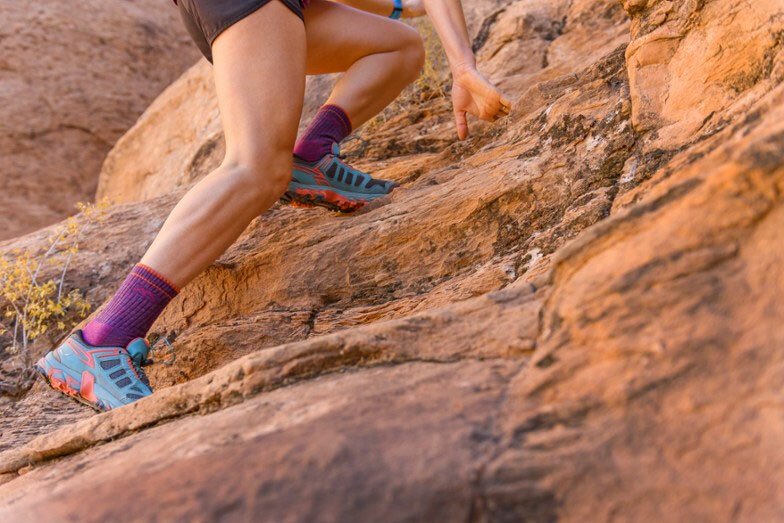 Good socks aren’t the only thing that will keep your feet blister-free. You need your hiking boots or shoes to fit your feet properly to ensure that you stay blister-free. This means snug, but not too tight with plenty of wiggle room for those toes. You also want to make sure that heel slippage isn’t an issue. What do you do if you already have the shoes and they are too roomy? Try adding in an insole or orthotic to improve the fit of the shoe – just be sure that doing so doesn’t make the fit too tight. You’ll also want to make sure that you only do your hikes in boots (or other shoes) that are good and broken in. Just wearing them for a few hours should be enough to break them in properly. Let’s face it – no matter how closely you follow these tips, blisters are bound to happen anyways. And when they do, you need to manage them so that you can keep on hiking. This means that you always should do your hikes with a first aid kit that can handle blisters. For me, that is something to pop the blisters with and some band-aids. Others swear by things like vaseline or Neosporin paired with some gauze and medical tape. Do whatever works for you and keeps your feet comfortable.